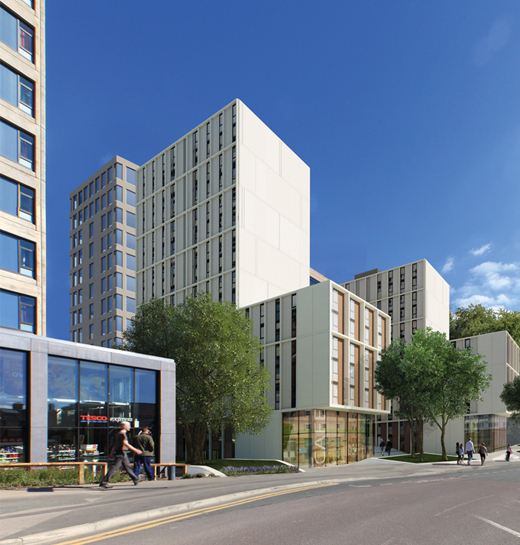 Downing continues to remain at the forefront of development in Leeds with Phase 3 of the Central Village student accommodation scheme. In addition to the 972 rooms, Tesco Express store and extensive public realm delivered in Phases 1 and 2, Cityside consists of 399 superior en-suite bedrooms and 75 studio apartments as well as a fully equipped on site gymnasium. The cluster bedrooms are pre-let to The University of Leeds under a 12 year agreement. The development enjoys a prime location in the University Quarter and just five minutes from Leeds city centre shopping and leisure district. As with previous phases the building is designed by the acclaimed John McAslan + Partners. Options for the fourth and final phase of the master plan are currently under discussion. “At Leeds Beckett we have worked with Downing both in partnership, as a client and as a neighbour since 2008. We have always found Downing to be a professional organisation with a culture of openness and a willingness to work together to resolve issues that arise for the mutual benefit of both parties”.